Because the Democrats are a corporate controlled party. And every time the Democratic Party sheepdogs herd us back in with promises of single payer Medicare for All, we are betrayed. Internal strategy documents obtained by The Intercept last month reveal the strategy that private health care interests plan to use to influence Democratic Party messaging and stymie the momentum toward achieving universal health care coverage. Already, the coalition is scoring points. Last week, for example, Senator Bernie Sanders called on the Democratic Party controlled House of Representatives to pass a much weakened version of single payer – not the gold standard HR 676. Ralph Nader wants Congress to pass the gold standard HR 676 — not the watered down Sanders’ version. Nader is urging all citizens to shift their focus from Facebook, Twitter and the computer screen to Congress. 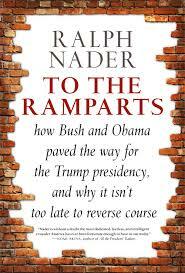 And to sharpen that focus, Ralph Nader is out with two new books. 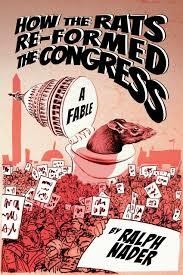 How the Rats Re-formed the Congress. To the Ramparts: How Bush and Obama Paved the Way for the Trump Presidency, and Why It Isn’t Too Late to Reverse Course. For a donation of $100 to Single Payer Action, we will ship to you both books signed by Ralph Nader. Two new Nader books to prepare for the next battle in Congress over whether we have a corporate health care system (corporate Democrats) or Medicare for All single payer system (HR 676 and Ralph Nader). Watered down single payer or the real deal? Act now to get the books for the holidays. Russell Mokhiber is a writer, editor and long time advocate for single payer in the United States.